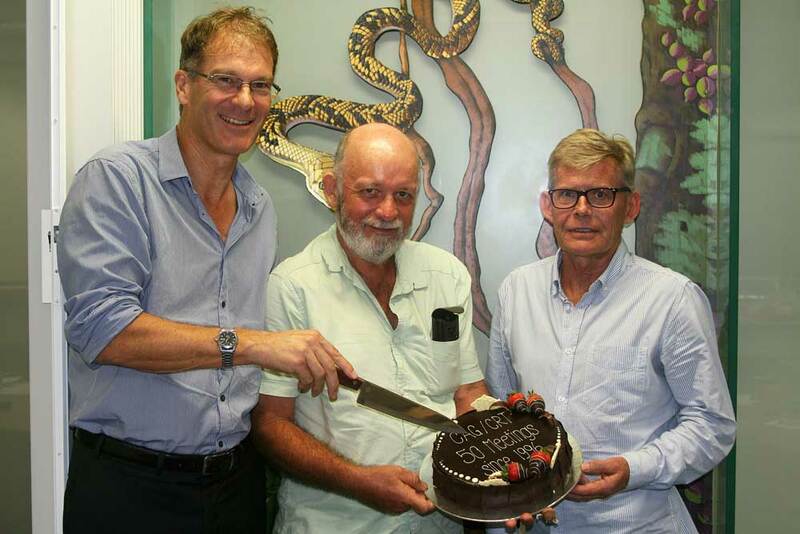 The Cassowary Recovery Team met on 24 February 2015 and celebrated the 50th meeting of the cassowary team. Steve Russell, the first chair of the Cassowary Advisory Group, explained how the Wet Tropics Management Authority had helped to form the group in 1996 to advocate for cassowary conservation and to advise the Authority’s Board. A major achievement of the group was to educate and engage the broader community to help look after the endangered cassowary population. Allen Sheather, also a former chair, has attended most of the 50 meetings. In 2009 the Advisory Group was revamped to become the official Cassowary Recovery Team, responsible for implementing the Australian Government’s recovery plan and providing advice on cassowary conservation issues. Andrew Maclean, Executive Director of the Authority, has been the chair of the Cassowary Recovery Team since its inception. This entry was posted in CRT news and tagged Cassowary Recovery Team, Community engagement by cassowaryrecoveryteam. Bookmark the permalink.